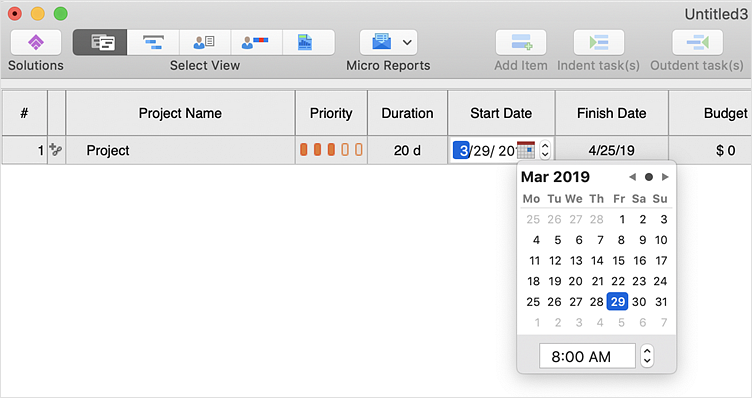 When you create an automatically scheduled task, ConceptDraw PROJECT sets the current date as the project start date and assigns it an estimated duration of one day by default. The time frame of a Project schedule is based on three-time parameters: Start date, Finish date and Duration of the tasks. These parameters are interrelated. Knowing these relationships, you can easily adjust the project schedule. When you create a new project, if you change the Start or Duration of a task, the Finish date will be recalculated automatically. If you change the Finish date, the Duration will be recalculated. If you change the Finish date, the Start or Duration will be changed depending on whose last modified date is earlier. If you change the Start date, the Finish date will be changed. If you change the Duration, the Start or Finish date will be changed depending on whose last modified date is earlier. The Start, Finish and Duration of a Phase is based on the earliest Start date and the last Finish date of its Tasks. The time frame of the entire project has two time parameters: Start date and Finish date. Start and Finish of the entire project are calculated based on the earliest Start date and the last Finish date of the entire schedule. You can manually change the Start or Finish date — thats will shift the dates of all project tasks. Result: Now you can see how do changes to the Start/Finish dates, or the Duration of the task affect the project schedule, created in ConceptDraw PROJECT.